Are you traveling over the hill and through the woods this holiday season? Don’t despair, with the help of the Alpha Mobile App, you have full control of your home DVR from anywhere. Wherever you are this holiday, you can manage your Alpha DVR remotely with a couple of quick keystrokes. The important sports game, the new hit show and anything else you want to watch will be waiting for you when you come home. 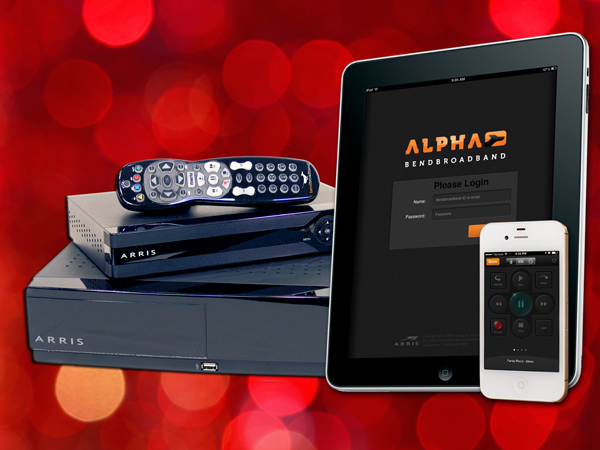 With the Alpha App you have full control of your Alpha DVR, even when you are away from home. As long as you can connect to a Wi-Fi access point or you have cell service on your smartphone, you’re in business. Once you’re home again after the holidays, you can use your iPhone or iPad to control any of the Alpha media players around your home. To use the App, you need an Alpha system at home. Installing the new Alpha Mobile App on your Apple iOS devices is easy. Simply go into the iTunes app store on your iPad or iPhone and search for “bendbroadband.” Install from there — it is absolutely free. If you’re curious about Alpha and want to find out more, please follow this link.